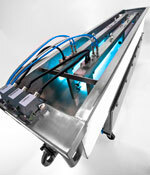 Aquionics’ OpenLine open-channel UV treatment system is equipped with low-pressure high-output amalgam lamps. The system treats secondary wastewater flows over a wide range of flows and UV transmittances. The AF-3 Series features LPHO amalgam lamps with a maximum output of 500 watts. The units use the full lamp output for high flow per kW system efficiency.